U-Fn is the pure and potent dried juice of the brown seaweed Laminaria japonica, which naturally contains 35% of U-fucoidan by volume, the only form of fucoidan that offers maximum healing properties. Due to the fact that U-Fn is an unprocessed, wholesome food supplement made from very edible and nutritious seaweed, it is more bioavailable than any other pure U-fucoidan and fucoidan extract on the market. And bioavailability is key since it guarantees the proper digestion and absorption of U-fucoidan in humans and animals. Just as citrus fruits serve as a better source of vitamin C than a multivitamin, so does our product offer you the greatest benefit in the rawest and healthiest form. 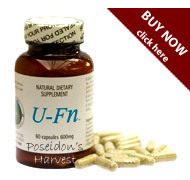 U-Fn is 60, 600mg capsules per bottle. U-Fn is made in the USA. In 1996 two Japanese research facilities, Biomedical Research Laboratories of Takara Shuzo and Research Institute for Glycotechnology Advancement discovered that U-fucoidan, existent in the brown seaweed Laminaria japonica, promotes apoptosis. Recent research done on fucoidan has confirmed these original findings. More information about these and other studies can be found at PubMed, a database of scientific studies maintained by the US National Library of Medicine and the National Institutes of Health: PubMed Fucoidan & Apoptosis. Many different extracts of fucoidan and U-fucoidan are available on the market today, however none are able to offer U-fucoidan in its purest form, as it is naturally found in the brown seaweed Laminaria japonica. Extracts offering fucoidan and U-fucoidan in high concentrations are created by stripping the fucoidan away from its natural environment, leaving just the isolated element which is not as easily absorbed by the body. The process by which U-Fn is made involves no such thing. From the very harvesting of the brown seaweed to the bottling process, the greatest effort is made to maintain the integrity and purity of the U-fucoidan. The natural brown seaweed extract U-Fn is not cooked, boiled, chemically processed or altered. It is not made into a liquid. It has no preservatives, conservatives, sugar or coloring added. The idea behind U-Fn is simple: just drink it with water and obtain the same great health benefits as found at the very depths of the ocean! * The Food and Drug Administration has not evaluated these statements. This product is not intended to diagnose, treat, cure or prevent any disease.